04The Brevard College community is grieving the loss of its beloved retired coach, teacher and mentor to student-athletes, Leighton “Chick” Martin, who passed away Friday, June 3 at the age of 87. To honor Martin and his years of dedication to the college, a memorial service will be held Saturday, June 11 at 3:30 p.m. in The Porter Center for Performing Arts at Brevard. Martin’s contributions to Brevard College athletics are nearly too numerous to count. 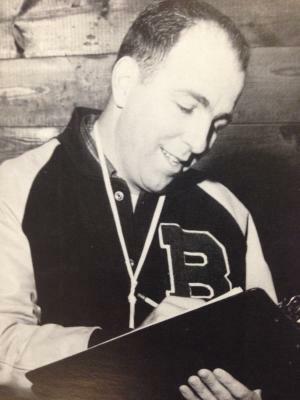 Inducted into the Brevard College Athletics Hall of Fame as a part of its inaugural class in 2004, Martin served as the athletic director, chaired the department of health and physical education, and coached the men’s basketball team from 1955 to 1972. He distinguished both himself and the college by serving as the Director of the National Junior College Athletic Association for a decade and as president of the Western North Carolina Junior College Athletic Association during his tenure at Brevard. Martin is still the winningest coach in Brevard men’s basketball history, emerging victorious on over 240 occasions and capturing four conference championships. He was the first Brevard coach to take a team to the NJCAA National Tournament, a feat he accomplished twice. He was a member of the Western North Carolina Sports Hall of Fame Committee and the Brevard College Alumni Honor Roll. In 2010, the BC Athletics Department hosted the Chick Martin Tribute – a celebration of the legacy of Chick Martin. The event launched the Chick Martin Challenge, which led to a drive for the funding of the Tornados’ new weight room facility housed inside Boshamer Gymnasium. Thanks to donor support, the center offers the campus 5,500 square feet of workout space in an open, glass wall setting and features the latest weight training and conditioning equipment. One of Martin’s most lasting tributes came on January 21, 2012, when the playing surface at Boshamer Gymnasium was permanently renamed “Chick Martin Court” in his honor. Martin oversaw the construction of the facility, which opened in 1962. “Seeing Chick Martin’s name on the gym floor provides us with a reminder of Chick’s historic influence on Brevard College athletics, and the inscription will serve to preserve his legacy in the years to come,” said Ken Kolb, president of Brevard College’s Tornado Club, at the time of dedication. Also in 2012, an anonymous donor established a scholarship in honor of Chick and Ruth Martin, which provides financial support to BC student-athletes. “The Martins have such a long history at Brevard College, and are so widely loved and respected, that this is a most fitting honor for them,” said Susan Cothern, executive director of development, when the scholarship was established. Those wishing to honor Martin and help continue his legacy at Brevard College may send gifts to: Brevard College; The Chick and Ruth Martin Endowed Scholarship, One Brevard College Dr., Brevard, NC 28712.